Harran and Sanliurfa is part of the Tentative list of Turkey in order to qualify for inclusion in the World Heritage List. The investment in my ‘All Turkey Tour’ of 1991 keeps on giving gifts. With a friend I had joined a 3 week group tour by bus all across Turkey. During that trip I visited 8 sites that are nowadays WHS. Also we touched upon numerous interesting TWHS. One lingering on Turkey’s Tentative List is Harran and Sanliurfa. These two ancient cities (located 40km apart) were among the highlights of the 1991 tour. 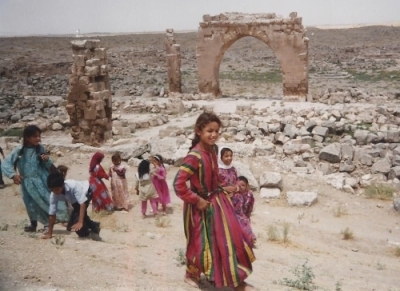 This was mostly because of their very remote and oriental setting: I had not been outside of Europe at the time and Harran lies only some 25km north of the Syrian border. Sanliurfa is a city of 2 million inhabitants. It is marketed as a Holy City and pilgrimage town. Old Testament prophets such as Jethro, Job, Elijah and Abraham are believed to have lived in this city. In ancient times it was known as Edessa. Central to the city is The Pool of Sacred Fish, believed in Islamic tradition to have been the place where Abraham was thrown into the fire by Nimrod. This is also the only place that I remember of my visit – it obviously is tourist attraction #1. It’s very very old: first inhabited in the Early Bronze Age III (3rd millennium BCE). It had a sanctuary to the Mesopotamian moon god Sin. It was located on an ancient trade route along between the Mediterranean and the plains of the middle Tigris & further into Persia. It was the site of the Siege of Harran in 609 BC by the Babylonian Empire upon the Assyrian Empire. Pliny the Elder wrote about it. It held the first Islamic University and its remains are still visible. It once was the capital of the Umayyad Dynasty. T. E. Lawrence (Lawrence of Arabia) surveyed the ancient Harran archaeological site. There were precisely 3 photos of Sanliurfa and Harran present in my 1991 photobook. They coincidentally show the main aspects that give the sites their value: Sanliurfa's Pool of Sacred Fish, Harran's adobe beehive houses and (attached here) a view on some of the archaeological remains at Harran.